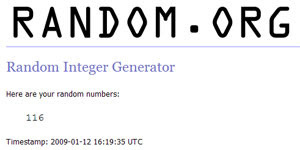 And the winner is Roni with Comment #116 for The Tale of Despereaux Book Review and Giveaway. Congrats and thanks to all who entered. As always, keep checking back. More reviews and giveaways to come, including one for the Inkheart book! I looooove that book! Congrats to the winner! Hi there! I followed your comment from my site to your site. What a neat idea to focus a site on books. I'll be back!